Too often, we think of the customer’s buying process as something that, once we understand it, is fairly structured and defined. Our job as sales professionals becomes aligning our selling process with the customer’s buying process, moving through the process in a disciplined manner. 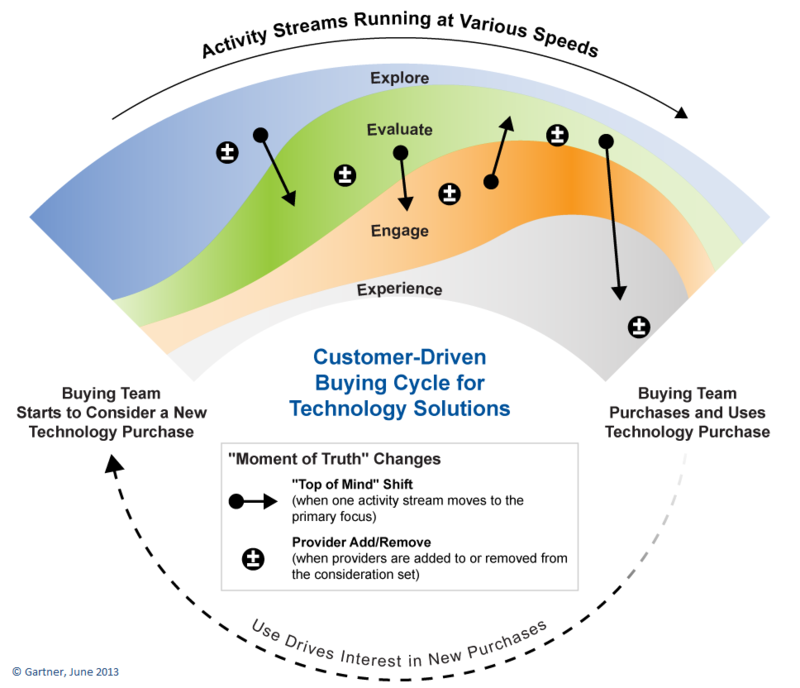 I think there is a different view of the buying cycle, one that is more “squishy.” Hank Barnes of Gartner, has an interesting concept of the buying cycle being a series of “activity streams,” each going at various speeds. These streams are constantly working–but with differing levels of focus and activity. The outcome of these buying streams may result in a purchase–or no decision, depending on how the customer aligns themselves and manages the process. Hank pictures the process something like the picture below. I think this picture represents a lot of what I see in B2B buying cycles. Customers are always exploring, looking for ways to improve, seeking new ideas. Every once in a while, something captures their attention. They may evaluate making a change to the way they do things—note this isn’t necessarily evaluating a solution. At some point, they begin to formalize things, organizing themselves to buy, engaging others, both inside the organization and outside the organization. They may make a buying decision, gaining more experience in the implementation. Over time, they look to improve and may reenter the cycle. Contrary to what many think, this process is very fluid, constantly changing. At some points, activities in a certain value stream are stronger than others. The customer may “enter” and “exit” a formal buying process at any time. They may or may not actually decide to change. How do we know when the customer is going to buy? In their “exploration” phase, we can invest a lot of time but they are only exploring. How do we know when they are truly serious, that they intend to buy? As the diagram outlines, all these cycles are going on simultaneously. The outcome of any cycle could be to enter into a buying cycle and actually buy, or it could be deferred, moving into more exploration. Do the customers really know how to buy? 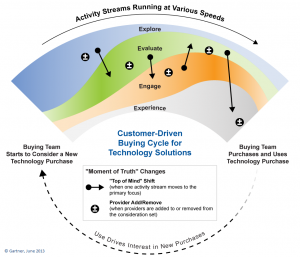 Various players, within the customer, can actually be in different activity streams at the same time. Some might be exploring, some may be evaluating, still others engaging. However, until they are all aligned and in the same activity stream at the same time, they won’t buy. What happens if they move through these and we don’t know or get involved too late? Customers leverage multiple resources and channels in their evaluate and engage process. We see, increasingly, they don’t involve us until very late in the process. First, we don’t have to wait until the customer is “in” a buying cycle. Since they are constantly exploring, evaluating, engaging, and experiencing–we have the opportunity to drive a buying cycle. Through compelling Insight, thoughtful conversations about new opportunities or ways of doing things differently, we can influence and alter these activity streams. We have an opportunity to disrupt this process. By making the “pain of doing nothing” greater than the “pain of change,” we can drive the buying process. We can move the customer through the cycles of exploring, evaluating, engaging, and experiencing. Second, we can offer real leadership in helping the customer organize to buy. Each player will in a different activity stream. By helping the customer organize, align, and define their process we can help the customer move through these activity streams in a disciplined manner-culminating in a buying decision. We can add structure, discipline, and focus to this “squishy” process. Third, since this cycle never stops, we can continue to engage and grow our impact with the customer, helping them improve their execution and grow. In crass sales terms, growing our share through cross sell and upsell. The “squishy” buying cycle offers us tremendous opportunity to provide leadership, collaborate, and create value. The “squishy” buying cycle demonstrates the importance of providing leadership through compelling Insight, moving the customer purposefully through the buying cycle. Are you prepared to take advantage of the customer’s “squishy” buying cycle? thank you for sharing this model and your thoughts on it. IMHO you seem a bit too optimistic what buyers do. I see individuals within the buyer organization at different levels of frustration (e.g.. having too high cost, not enough functionality or incapability to cash in on an opportunity). The normal reaction to this frustrations seems to be to live with it as long as possible. Only when the frustration becomes intolerable, people are willing to question status quo. Once a seller has identified such a person, I am with you that sellers have to help this person to build a coalition of relevant stakeholders who share that the frustration is unbearable. It this does not happen nothing will be bought. However the unbearable frustration might not b enough,for a buying decision if the coalition of stake holders cannot establish a common vision and see first steps how to get to that vision. So the model of the parallel streams works for me. However I have a more pessimistic view what drives the people at the customer organization through these streams. Bravo on making us aware of the “Squishy Sales Process”. I believe in our attempt to simplify or codify our buyers behavior we can create an environment that gives us a false sense of security as a symptom and unpredictable Forecast or should I say “Hope-Cast” as an outcome. I think Hank Barnes has created some very powerful imagery here that adds a lot of Clarity for us optimistic sales types. As a rather “Reptilian” career sales person myself I had a tendency to see every movement during a campaign as an advancement when in reality it is most likely a continuation. Following Hanks analogy of streams it is like we are Whitewater Rafting with the client on his “Journey to Product Enlightenment” as he is going through his Buying or in most cases Evaluation Cycle. We think we are cascading down stream to closure to find out at the end of our quarter when we get desperate and actually ask for the order, only then do we find out we were stuck in “Eddy” going around in circles of indecision, free consulting, endless demo’s and no outcome events. The reality of the situation is the prospects say they were just looking and no one had the authority to buy which all too often ends up in a No Decision. This is a Scourge in the sales reps world that is gaining Momentum, depending on who you listen to but I would say about 30% of Forecasted opportunities are ending up in the No Decision Bucket. I have a Term I call LAZY which is actually an acronym for Lots of Activity Zero Yield which unfortunately describes what happened to me in many sales cycles. I can say it now however it was tough to admit it to myself or my boss when I was actually going through defending my Forecast. I was looking at things the way I wanted them to be rather than the way they really were. This is where the Rose Colored Glasses and Happy Ears come into play. 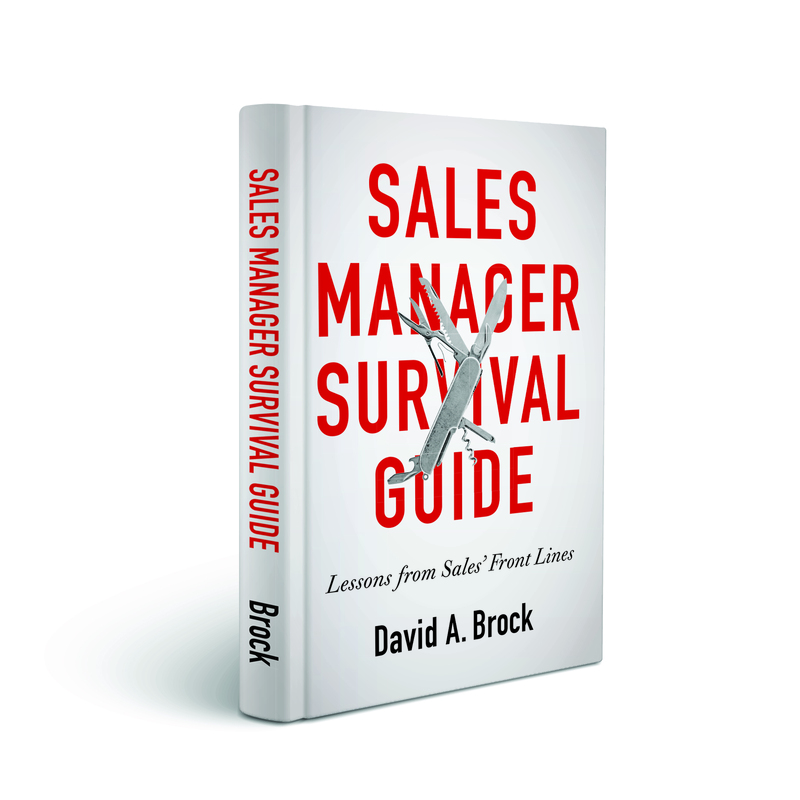 Being aware of the “Squishy Sales Cycle” can help reps that are experienced enough to ask themselves the Tough Questions and to face the answers that will enable a rep to determine that the movement they are experiencing is actually forward momentum. Which is carrying the Key Stakeholders, Technology Innovators and the Victims of the current process and the sales person “Downstream” to a an objective and informed decision! 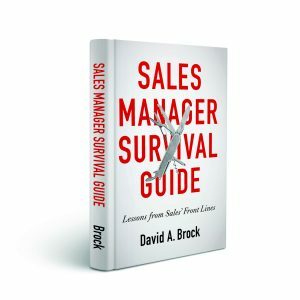 This is where tools like BANT or MEDDIC can help sales teams who have the courage, rigor and discipline to look for No and ask Tough questions of themselves and the client to determine exactly where they are in the Buyers Process. 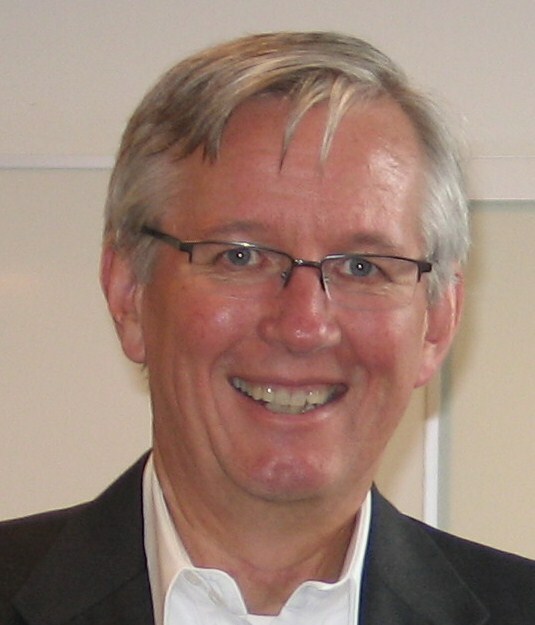 Following with Hanks “Stream” analogy these Qualification tools truly act as a GPS systems for the sales team to define exactly where they are in the Buyers purchasing “Journey” and how close or far they are to their ultimate destination which is a Decision. When we do this we truly become what todays Buyers need “A Buyer Assistant” who shows up wherever the Buyer is on his Journey to Offer Clarity. The buyer’s reluctance to decide in today’s hyper accelerated world is understandable. They are stuck in a world of Increasing Complexity evaluating a myriad of Solutions that all sound the same which creates a “Sea of Uncertainty”. The Buyer has difficulty “Seeing” the root cause of their Problems, they don’t know who to trust and consequently suffers Paralysis by Analysis. Uncertainty is the Enemy of Decision Making and Clarity is the enemy of Uncertainty. The overachieving reps today come to the rescue with Clarity reflected in their value propositions backed up with even better documented Metrics, Success Stories that enable the customer to clearly see “Their Own Oil Spills” so they can develop 20/20 vision on their problems and who just might be able to help them out – Yep us – The Buyer Assistant / Sales Rep.
What we have all learned over the last 30 years is that selling is becoming more of a win-win / grow-grow collaboration between a client and consultant than the win-lose Persuasion games of the past. When we see successful customers with our solutions they truly “Participated in their own Rescue” because they trusted us, followed our guidance, documented their success when we coached them to and reinvested in services, training, support and even new products. Oh well Time to get off the River and go Sell Something. Thanks for the great thoughts and discussions. Jack, sorry for the slow response, thanks for the wonderful discussion. I love the concept of helping the buyer through offering “Clarity.” Think I’ll write more about that specific issue 😉 Thanks so much!